In the full-size truck world, there's three American stalwarts and basically one Japanese competitor (sorry Nissan it's not you). The Toyota Tundra has a loyal following in the truck world. But it also isn't a Ford, Chevy or Ram and there are few things that are more American than a big pickup truck. So this Japanese truck has to differentiate itself from the pack. And it certainly accomplishes that. As more trucks are going lighter with smaller engines, the Tundra is going the opposite way. In 2015, the Tundra drops the V6 engine and only offers a couple V8 engine options, emphasizing power over fuel economy. Toyota added their off-road TRD Pro trim to the Tundra making this trim quite rugged as well as sporty. So, Toyota is trying. And, after a major design overhaul last year, Toyota tweaked the Tundra further this year and made cosmetic improvements to the interior, which was much needed when compared to the lavish interiors of F-150, Silverado and Ram. With a full-size pickup truck, it's difficult to really push the envelope in design. Each automaker is working within the same design constraints and the Tundra looks the part of being a big, strong truck. It can hold its own in overall exterior appeal when compared to the American trucks, but it also doesn't have much distinction either. The grille, like the rest of the body, is simple with little design flare. 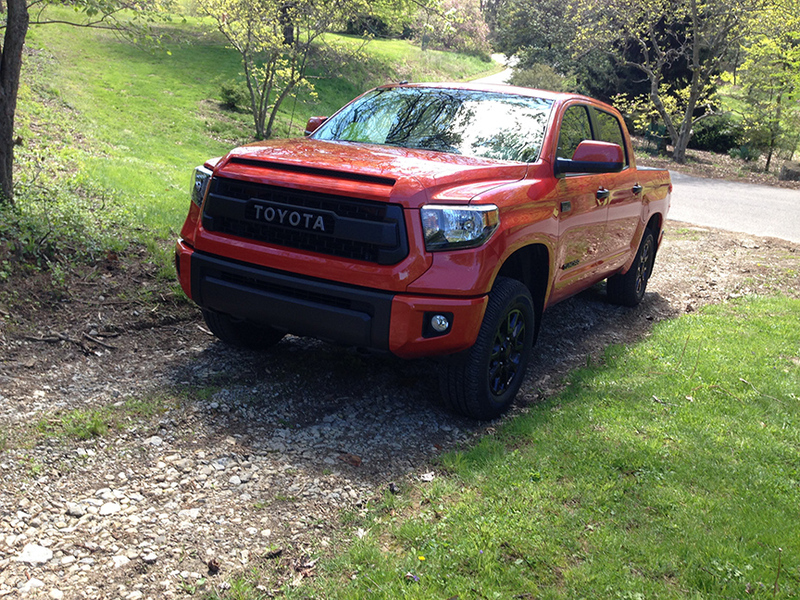 Having undergone a complete redesign last year, the Tundra still feels a little dated. The ultra competitive pickup truck world requires constant evolution, and the 2015 version really has no exterior cosmetic changes. For years, auto critics have mentioned the necessity of updating the interior of the Tundra to keep up with the competition. With the Big Horn, King Ranch and High Country trims, the Tundra's competition raises the luxury bar very high. Even the highest trim level of the Tundra can't quite compete with the upper echelon trims of the competition, but it's certainly come a long way throughout the years too. As part of the overhaul last model year, the Tundra's interior remains mostly unchanged from 2014 to 2015. 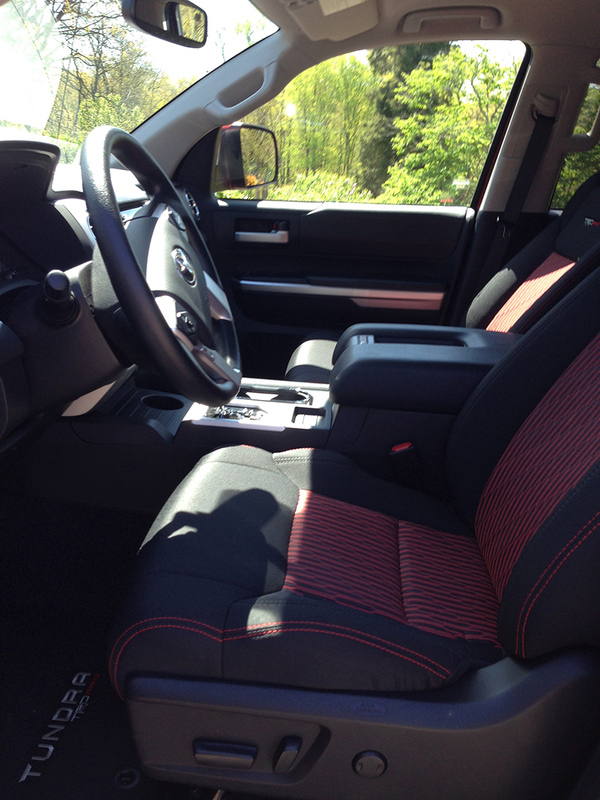 The interior is nice, as nice as a Tundra has been. Again, it's not going to dethrone the big three when it comes to lavishness and comfort, but the Tundra is certainly improved and comfortable. The softer touch points are noticeable and appreciated. In the CrewMax and Double Cab configuration the rear legroom and headroom is unrivaled and vast. Overall cabin space is one of the highlights of the Tundra. This is a full-size pickup and you definitely realize it inside where all passengers can stretch out in comfort. Seats, whether leather or upholstered, are firm and supportive. The Tundra is a harsher overall ride than the F-150 or Silverado, but that's more about the frame and suspension than the actual interior and seats. Technology in trucks is a rare thing. Each automaker knows that the regular pickup truck consumer doesn't need the most current technology or the latest gadgets. So, like its rivals, the Tundra isn't chock full of such gadgets and gimmicks. But that's okay. What technology does exist more than acceptable. We are fans of Toyota's Entune infotainment system. We find it relatively easy to use and appreciate how well it works with smart phones. Most trims offer a 7-inch touchscreen, while some of the lower trims have only a 6.1-inch touchscreen. We can only speak about the 7-inch screen and can say that it is bright, colorful and offers an intuitive interface. Apps work well with the Entune system and offer at-your-fingertips search engines, Pandora streaming radio, traffic updates and much more information that plays well with the smart phone generation. And, all of this technology is available on every trim, not just the top-of-the-line options. We question how important fuel economy is to the big truck consumer. These owners buy a truck for its capability and comforts more than how often it needs to be refueled. That being said, the Tundra is one of the least fuel efficient trucks on the market. This year, with no V6 engine offered, the fuel economy gets worse. Two-wheel drive Tundras average 15 mpg/city and 19 mpg/highway. All-wheel drive models (which is what we recommend) average slightly less at 14 city and 18 highway. Unlike Ram, Ford and Chevy/GMC, there is no diesel option or even a turbo injected option. With only V8 engines now, the Tundra is squarely a guzzler of a pickup truck. In a week's worth of driving we averaged 15 mpg. JD Power and Associates thinks highly of the Tundra when it comes to reliability. They rank the Tundra "among the best" in all mechanical areas. And they rank the truck "about average" in overall quality. Where JD Power knocks points on the Tundra is in the areas of design and features (which we've already addressed in an equally critical way). The Tundra is one of the safest trucks on the road, according to IIHS. They rate the Tundra with their top rating of Good in their crash tests. The National Highway Transportation Safety Administration gives the Tundra four out of five stars in overall safety rating too. The Tundra is loaded with standard safety features including antilock brakes, stability and traction control, trailer sway control and various airbags. The top-of-the-line trims have additional features including parking sensors and a blind spot monitoring system. As usual, we'd like to see all sensor technology as standard across all trims (just as rear cameras have become standard and are so for the Tundra). As mentioned, there are only V8 engines offered in the Tundra. A 4.6-liter comes standard (as both rear-wheel drive and front-wheel drive) but there's also a more powerful 5.7-liter engine too. The 4.6-liter engine makes 310 horsepower with 327 lb./ft. of torque offered. The bigger engine has 381 horsepower and 410 lb./ft. of torque. Both come standard with a six-speed automatic transmission. We'd love to see an updated transmission to both help with more effective shifting and to improve the fuel economy. Also, if a truck engine is only going to make 310 hp, then why have it as a V8 instead of a more efficient V6? As such, we do recommend the 5.7-liter engine, but do not feel the 4.6-liter engine is the way to go for the consumer. Maximum towing capacity of the Tundra is between 9,800 pounds and 10,500 pounds. 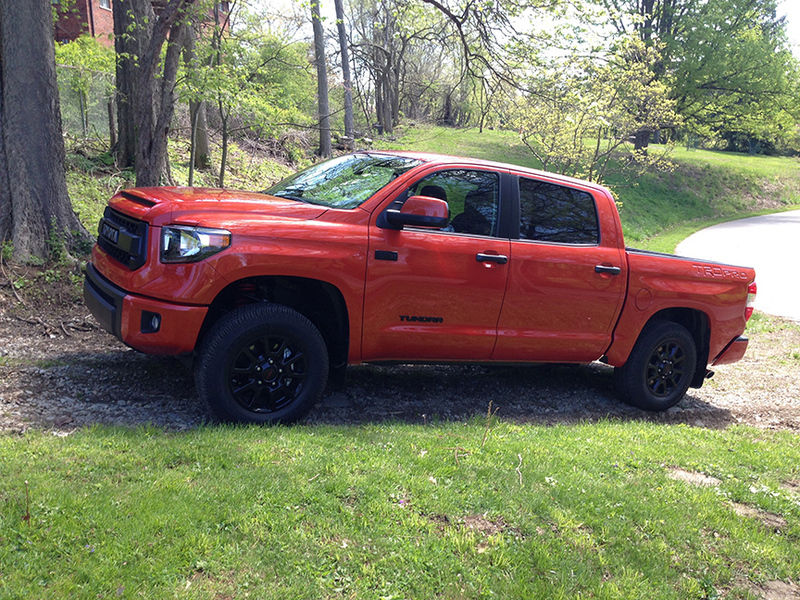 The TRD Pro trim is the most enjoyable driving truck amongst the Tundra family. It's a perfect blend of power and off-road fun. 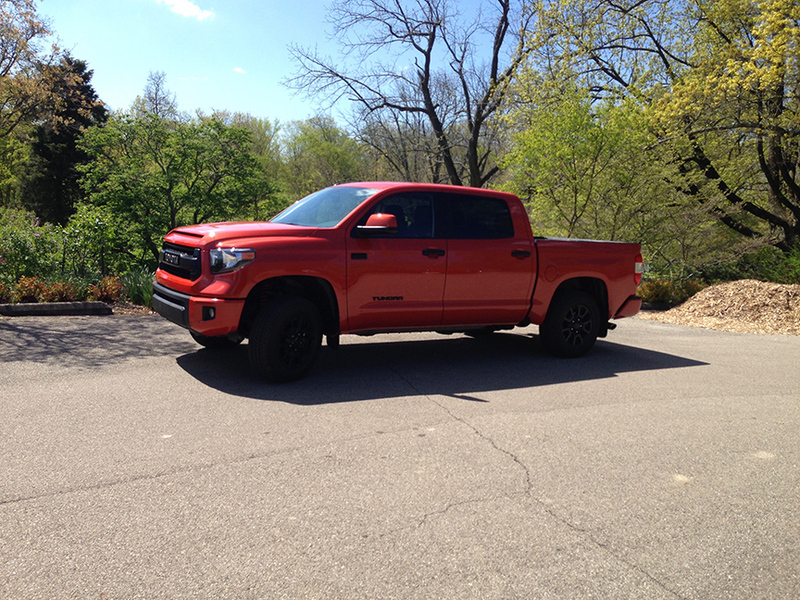 On road, the TRD is a firm ride, but all the Tundras are firm. Where many F-150s and Silverados have segment-leading ride comfort, the Tundra is more old school. It's still a truck in the purest of terms. Our tester had the 20-inch wheels which make for an even bigger drive performance. The Tundra drives big and handles just the same. The TRD trim's growling exhaust offers some exhilaration, but otherwise, the rest of the Tundra line is less than inspiring to drive and is the least comfortable of the four leaders in the full-size truck segment. Base model Tundras start around $28,000 which is a couple thousand more than similarly equipped Silverados and Rams. However, without extravagant trims or diesel engine options, Tundra can maintain a lower overall price point when compared to the wide ranging variants of its competitors. 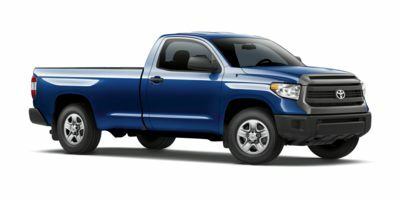 However, for a gas guzzling two-wheel drive, bare boned trim, we'd like to see that starting price come down by a couple thousand dollars or for Toyota to continue to improve the overall value and quality of their full-size pickup. For consumers who want to use a full-size truck as both a daily driver and a weekend warrior, the Tundra is as good as any. Competing against Ford, Chevy/GMC and Ram is very tough competition. And each of those trucks are big sellers and each has loyal followers. The Tundra's ride is a little firm and the engine and transmission are little inefficient. For the consumer who only wants a truck for a daily driver, there are better options (but really who buys a big truck to just commute?). But if you want a truck that is capable, has off road ruggedness and is continually improving with every model year, then the Tundra is proving its value within this ultra competitive segment. Toyota sees where the bar is within the segment and each year they continue to climb toward that and they do so with a handsome, rugged full-size pickup truck. 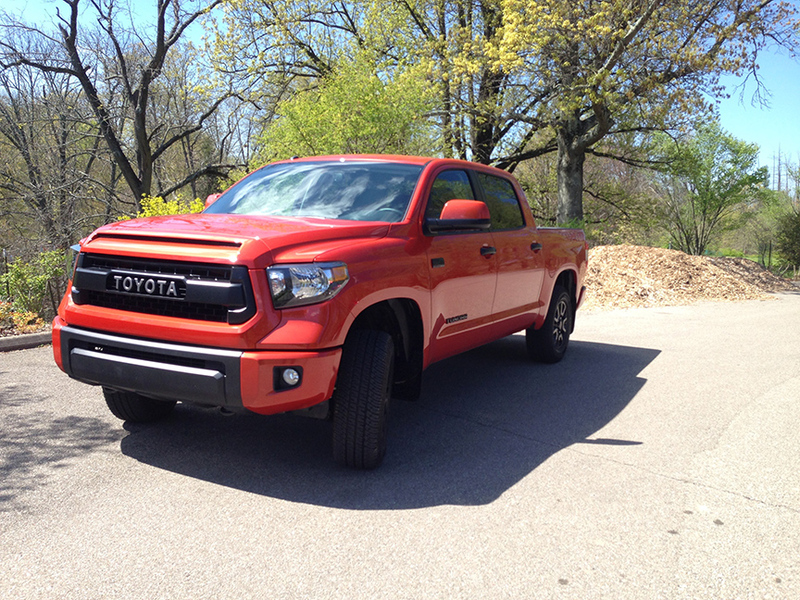 Interested to see how the 2015 Toyota Tundra ranks against similar cars in terms of key attributes? Here are the 2015 Toyota Tundra rankings for MPG, horsepower, torque, leg room, head room, shoulder room, hip room and so forth.